Tattooing has been around for thousands of years and gained popularity in recent years. To many it seems like a great idea at the time although around a third of people regret their decision and soon look into how to remove it. Laser is now the gold standard for tattoo removal, and is favoured over chemicals and dermabrasion due to their greater risk of scarring. Why choose St James Tattoo Removal? We are fully qualified, insured and our state of the art ND:Yag Q switched laser is designed and built in the UK. This is very important when choosing where you go for your treatments. Please call for a consultation and patch test, we will also explain the importance of using a uk laser that conforms to EU regulations. If other companies don’t advertise this they probably are not using a uk or approved laser (Medical Grade Laser). 10 treatments of laser tattoo removal and this tattoo is gradually fading away to nothing and showing great clear skin. Basically the laser light goes through the skin and is absorbed by the tattoo pigment, as the laser light is absorbed by the ink it causes an acoustic shock which then breaks it into smaller particles which the body can then dispose of naturally using its drainage system (Lymphatic), over the treatment course the tattoo becomes more faded as layers are broken down and removed. This depends on a wide range of variables, so it’s always preferable to get in touch so we can give you a more accurate idea. If you’re going to cover over with a different tattoo then less treatments are needed. Will the tattoo completely go? It is possible for complete removal but this again depends on the variables, type of tattoo, ink depth, ink used, colours, skin type, healing ability etc. Some people are looking to lighten their tattoo to a certain level as they want to get a different type / colour over the top, this will obviously take less treatments. Can all ink colours be removed? The ND:yag Q switched laser is best for treating black, blue and certain green inks when using 1064nm and reds when using 532nm, other colours will absorb the laser light although some colours prove more troublesome like certain yellows, purples etc. No, but this can’t be guaranteed due to different skin types, quite often having the tattoo put on scars the skin but this isn’t noticed at the time as the colour hides it, this can show as the ink is broken down and skin becomes normal colour again. Sometimes blistering or bleed spots can occur, blisters shouldn’t be picked as this is the bodies natural protection, if this happens we can adjust the treatment / machine to suit your skin. Also hyper or hypo- pigmentation of the skin can occur but is rare, this is where the skin goes lighter or darker in the treated area. This is usually transient and goes back to normal in a few weeks. This can be anywhere from 5 minutes upwards depending on the size of the tattoo. In your first visit we will complete a full consultation and patch test to check you are suitable for laser tattoo removal treatment. Does the tattoo removal hurt? It has been likened to being struck by an elastic band when you pull it back and snap it out, some say having the tattoo put on is worse. If you prefer you can apply a numbing cream (e.g Emla cream) a few hours beforehand, read instructions on cream for full effectiveness. With the immediate laser-tissue interaction there is a raised blanching or ash like appearance of the treated area and the tattoo temporarily disappears. 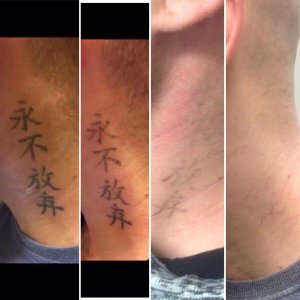 Once the ash like appearance has gone the tattoo re-emerges, the swelling usually resolves in 24 hours, it’s over the next 4-6 weeks between treatments that the body does its part in the tattoo removal. Prices start from £40 per treatment (5x3cm). Consultation / Patch test £20 (this will be deducted from your first treatment). We are unable to take card payments at the moment.